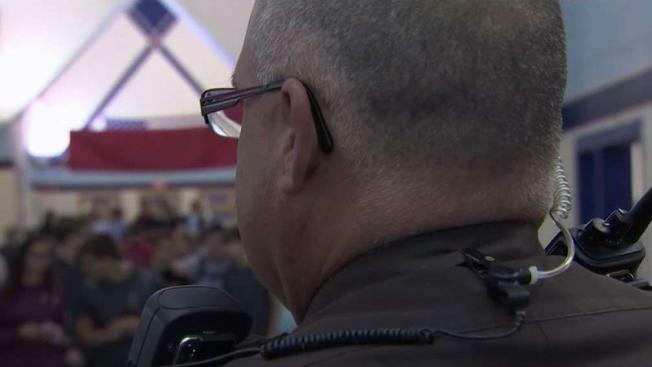 Several local school districts fall below a national recommendation for police resource officer staffing levels, a review by the News4 I-Team found. A recommendation by the National Association of School Resource Officers, a non-profit organization that helps train and advise school resource officers, recommends one officer for every 1,000 students. But an I-Team review of school resource officer deployments in five of the largest Washington, D.C.-area districts shows nearly 40 high schools are well below the recommendation. Those schools each had more than 2,000 studentsbut only one school resource officer. Some of the largest schools in the region, including Chantilly High School in Fairfax County, Montgomery Blair High School in Montgomery County, Washington-Lee High School in Arlington County and High Point High School in Prince George’s County, had between 2,200 and 3,100 students but just one resource officer per school. Prince George’s County Public Schools, Fairfax County Public Schools and Montgomery County Public Schools said they supplement school resource officers with school security staffers. A spokesman for Montgomery County Public Schools said they have eight security employees at Montgomery Blair High. The District of Columbia Public Schools is the only local district to meet, and even exceed, the national recommendation, according to the I-Team review, with a ratio of one officer per 827 students in the District. However, the Metropolitan Police Department’s system assigns multiple officers to share responsibility for policing schools, with 110 police officers assigned to serve approximately 90,000 public school and public charter school students. Don Bridges, past president of the National Association of School Resource Officers, said having properly trained school resource officers working with law enforcement is critical. “You have to do whatever is in the best interest of students,” he said. Some local officials say lack of funding and recruiting problems are to blame. A school resource officer costs the county about $100,000 annually, he said. He’s called for increased funding to place at least 10 officers at Montgomery County’s middle schools. Separately, a spokesman for the school system said police are in talks with a state advisory board about what adequate coverage would entail. “The reality is we need so many more of these officers as our school continues to grow and our population continues to explode,” Rice continued. Not every system is making moves to expand. Like Montgomery County, Fairfax is among the school districts that have hired security guards to bridge the gap. Fauquier County Public Schools added a dozen part-time security guards at high schools and middle schools, according to Fauquier County Sheriff Bob Mosier. He hears from parents who want even more officers, especially in elementary schools, he said. Reported by Scott MacFarlane, produced by Rick Yarborough and Katie Leslie, and edited by Steve Jones.